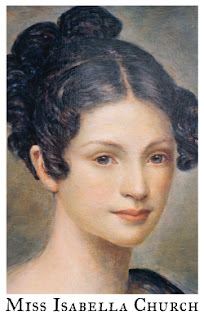 Isabella originally hailed from a monied family that fell on hard times after her father gambled away their fortune. Miss Church was forced into the employ of a launderette where it was discovered that she had a head for sums and could run the business with great efficiency. The Doctor met Isabella when he started taking his shirts to be laundered there at the advice of his mentor. 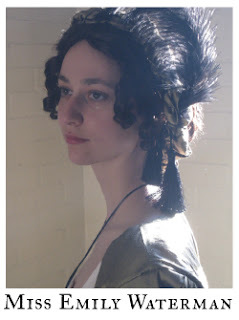 In 1797, the Doctor married Isabella, who his family considered to be of inferior birth and social standing. The Doctor was 'disowned' by his family and gave up any claim to his fortune to marry for love. 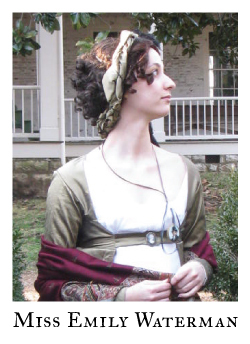 Isabella died under unfortunate circumstances while the Doctor was recovering from an injury in a military hospital late in 1807. Portrait painted by Mr. B. Jones of Whiteley Wood Road, Sheffield. The Doctor and Isabella’s daughters. Lucy, Molly, Rose and Francis Sophia. 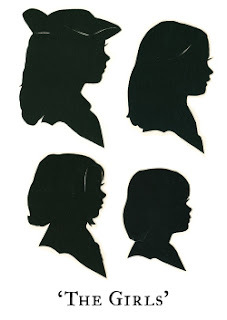 Silhouettes by Mrs. Anne Leslie of Shadow Portraits. a 74-gun third rate ship of the line of the Royal Navy, built by Barnard of Deptford and launched on 25 June 1785. 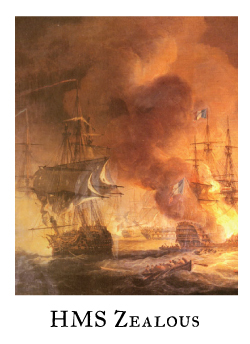 She served in a number of battles of the French Revolutionary Wars and the Napoleonic Wars, notably the Battle of the Nile, where she engaged the French ship Guerrier, helping to force her surrender. She was later cruising off Cadiz in 1801. She missed out on the Battle of Trafalgar, having been dispatched to Gibraltar for resupply, and later assigned to convoy duty in the Mediterranean. 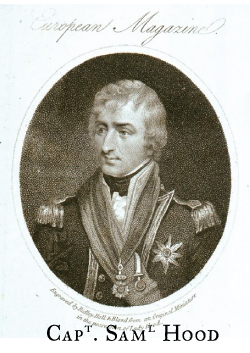 In 1797 Hood was given command of the 74-gun ship of the line Zealous, in which he was present at Admiral Horatio Nelson's unsuccessful attack on Santa Cruz de Tenerife. 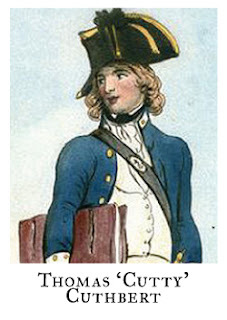 Captain Hood conducted the negotiations which relieved the squadron from the consequences of its failure. The Doctor joined the Zealous as ship’s surgeon in 1798, a year after Hood became her captain. Engraved by Ridley, Holl & Blood from an Original Miniature in the possession of Lady Hood. First encountered by the Doctor as a Midshipman aboard the Zealous, ‘Cutty’, as he was often called, was very popular. Cuddy was a most amiable fellow, well read and quite proficient as an officer. He could laugh at nigh anything. There was nothing that he could not gamble on, he must have lost three years wages over the course of our service together. And a stout lover of mirth and good liquor. Miss Waterman, being recently sent to America by her parents, is placed in the care of her father's old business partner, Mr. N. Hegwood of Albany, New York. The Doctor and Miss Waterman initially met at a gathering in the Ohio country. After the decline in Mr. Hegwood's health it is recommended that they move south for the warmer climate. Miss Waterman and the Hegwoods have recently taken up temporary residence in the Nashville area and are looking for a place to build a suitable permanent home.